There is no doubt that education and economic development go hand-in-hand. We know that efforts to build a stronger workforce begin with K-12 education, and earlier this year, we were proud to announce the addition of the Clark County School District to our board of directors, also known as the LVGEA 50. Our team continues to advocate for strategic initiatives that aim to strengthen our education system. This includes promoting apprenticeship programs, identifying real workforce needs and implementing a coordinated and aligned workforce strategy. We continue to see pockets of excellence in the region. Graduation rates are improving, Advanced Placement pass rates are up and our award-winning magnet schools and Career and Technical Academies are providing students with necessary skills for tomorrow. But while we have made great strides, we know there is still a lot of work to do. economic update from Applied Analysis. After more than two decades in public education, having the opportunity to serve as the Superintendent of the Clark County School District is truly a dream job for me. I could not be more excited to work with this community to improve our schools, and I can promise you that I will pour my heart and soul into this job every single day to do just that. was 10 years old and didn’t speak a word of English. My mother, who had only a sixth-grade education, taught me that education was my ticket to realizing the American Dream. If I’ve learned one thing, it’s that moms are usually right. children. Each of them found their passion in different places. My daughter fell in love with mathematics, one of my sons was all about sports, and my other son found inspiration in a welding class. Every child, no matter who they are or where they came from, deserves to discover whatever it is that excites them in school. All students should have a path to rich and rigorous learning that works for them. And realizing that promise in Clark County – or as I like to say, making CCSD #1 for kids – will be the driving force behind everything I do as your superintendent. Since I officially took the reins here in June, I have committed to making myself Clark County’s listener-in-chief. I come to this job with no shortage of big ideas – and I’m eager to outline and embark upon a specific action plan for CCSD – but that plan must be informed by feedback from the wide variety of stakeholders who know this community best. That’s why I began my tenure by launching the ‘Java with Jara’ campaign – a series of intimate conversations with CCSD educators, staff, families, local business leaders and other stakeholders. I set the aggressive target of making at least 100 visits to CCSD schools and departments and holding at least 100 meetings with community members by the end of September, and I’m on track to fulfill that pledge. As my listening tour is still ongoing, I’m not yet releasing my comprehensive agenda – but I’m already laying out some initial baseline objectives. Those include improving third-grade reading scores, enhancing college readiness, and increasing student participation in Advanced Placement (AP) courses. further fueled my determination. We’ve already had some amazing achievements in our schools, and there are plenty of places in the district where innovative approaches are yielding real results. We should not only be proud of those successes, but turn to them as inspiration for accelerating our progress and testaments to how much we can accomplish by harnessing the talent we have right here in CCSD. none higher than the expectations I have set for myself. As your superintendent, I will not rest in pursuit of achieving our ambitious goals, and I fully expect the community to hold me accountable. I’m committed to being as transparent as possible and to earning the community’s trust. I vow to work tirelessly with the Board of School Trustees and CCSD staff, with principals and teachers, with parents and students, and with community and business leaders like the LVGEA, to move our district forward. The Las Vegas Perspective quarterly survey examined opinions and attitudes of the Southern Nevada workforce testing sentiments around our region’s economy. This web-based survey was commissioned by Las Vegas Global Economic Alliance and conducted between July 13, 2018 and July 19, 2018. Since this survey is intended to poll the Clark County workforce, results remove self-selected retirees and unemployed workers as well as self-selected residents of other counties. The sample size of the survey is 500 with a margin of error of +/- 3.7 percent at the 90 percent confidence interval. please contact Anthony J. Ruiz at anthonyr@lvgea.org. The Southern Nevada economy rolled into mid-2018 riding the positive wave that has propelled it to new highs in recent years. A fast-growing employment base has served as the foundation for overall economic growth, and since matching pre-recession highs in early 2016, total employment in the Las Vegas area has set new records with nearly each passing month. Steady job creation pushed regional employment to a new milestone during the second quarter of 2018, as Las Vegas employment surpassed 1 million for the first time. placing between Nashville, Tennessee, and San Antonio, Texas. Southern Nevada reached the milestone due to an extended period of strong job growth that began in late 2013. 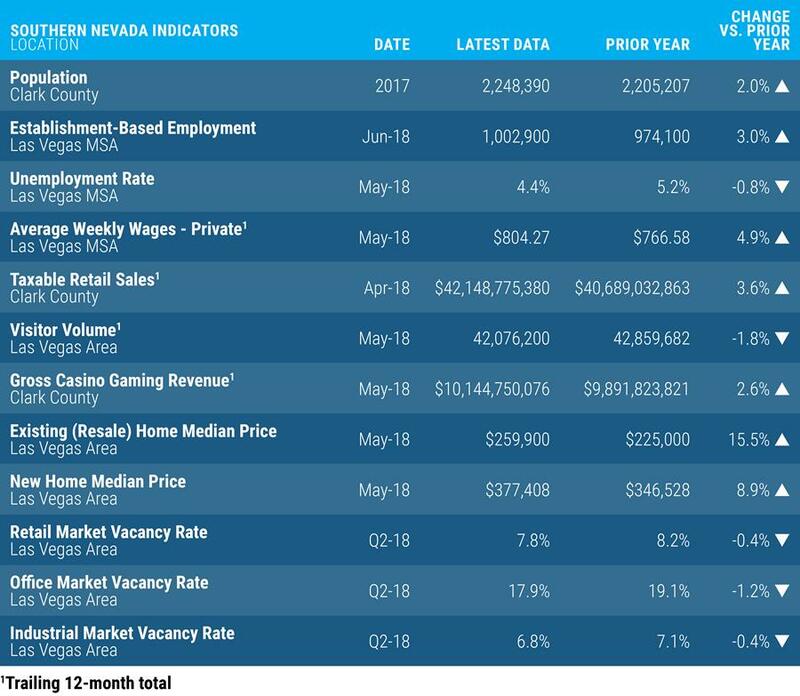 Since the start of 2014 through May 2018 (latest national data available), the Las Vegas area’s year-over-year job growth rate has ranked in the top 10 in 44 of the 53 months and in the top 5 in 19 months. among metropolitan areas with 1 million jobs. Southern Nevada has continued to post strong employment growth numbers over the past year, as well. In the 12 months through June 2018, regional employment grew by 28,800 jobs, which translates to a 3.0 percent year-over-year growth rate. The unemployment rate fell 0.8 percentage points on the year to 4.7 percent. (5,900 jobs, +6.1 percent), trade, transportation and utilities (4,500 jobs, +2.6 percent), education and health services (3,500 jobs, +3.6 percent) and leisure and hospitality (3,200 jobs, +1.1 percent). supported 34.1 percent of all jobs 23 years ago. Today that industry remains the primary regional employer, yet accounts for 29.5 percent of all jobs. Notable job share gainers include the education and health services sector, which expanded its employment share from 6.0 percent to 10.0 percent, and the professional and business services sector, which grew from 10.0 percent to 14.0 percent of employment. This shift of employment between industries is reflected in the Hachman Index, a national measure of economic diversity where a value of 100 is a balanced economy. Southern Nevada’s Index score in May 1995 was 52.7 and today stands at 72.4.
recruit, nurture and grow businesses from across the economic spectrum that will further diversify and strengthen the Southern Nevada economy for the many milestones ahead. The Las Vegas Global Economic Alliance and its partners in the LVGEA Perspective Council publish this newsletter on a quarterly basis. In addition to the annual research book and comprehensive economic update event in May, the Perspective quarterly newsletters address themes of Education, Infrastructure, and Regional Economic Competitiveness.